In case you missed it, the 60th Grammy Awards were on last night. The Grammys are the highest honor given to those in the music industry, but every year, there’s a large public outcry because it is abundantly clear that those who are involved with nominating and voting for the winners are severely out of touch. It probably doesn’t help things that the Grammys are arguably the most predictable of the big awards out there because the biggest awards of the night will more often than not go to the “safest,” least politically charged, most mainstream and/or likeable option off an already polished list of nominees. Typically, those values happen to align into giving the awards for Album, Record, and Song of the Year to straight up uber-successful mainstream pop acts or singer-songwriters that play the most to older generations. That usually means that most of the awards go to predominantly white men and women, even if there are much more deserving candidates. We saw that in full effect the past few years, last year, Adele swept all the major categories over Beyonce, the year before that, Taylor Swift won over Kendrick Lamar. The same thing has happened in different forms for years now. This year, it was clear that those who run the Grammys and determine the nominees were including more diverse candidates on purpose because of the fallout from last year’s show being dominated by Adele. For example, just look at the nominees for Album of the Year; not only did Kendrick Lamar get nominated for his earth-shattering and hyper relevant album, DAMN., Jay-Z, Childish Gambino and Bruno Mars were also included, leaving Lorde as the only stereotypical candidate in that category. But despite their best intentions, the Grammys were still clearly far behind the times – according to Pitchfork’s hot and, frankly, overbearing take on the Grammy ceremony, only 17% of the award winners were female. There’s no disputing the fact that Bruno Mars is a supremely talented guy. He sings, dances, has a majestic voice that can do everything from between the sheets ballads to straight up pop masterpieces. But, seeing Mars walk away with six awards, including all three of the biggest awards of the night (Album, Record, and Song of the Year) over other, more culturally relevant and deserving candidates like Kendrick Lamar is just the latest example of the Grammys being biased towards the safest, most mainstream option. Mars’ newest album, 24K Magic, certainly had its moments (not many), but it doesn’t hold a candle to Kendrick’s DAMN or “Humble” in sheer scope, importance or longevity. With a new, fresh batch of nominees to choose from (this year, there was no Adele, no Swift, no Kanye), Grammy voters chose an extremely talented performer in Mars, but he was still the safest of the group, and so the Grammys continue failing to prove themselves as generally being with the times. Disappointing to see that even after all the fallout from last year’s ceremony, nothing has really, truly changed. 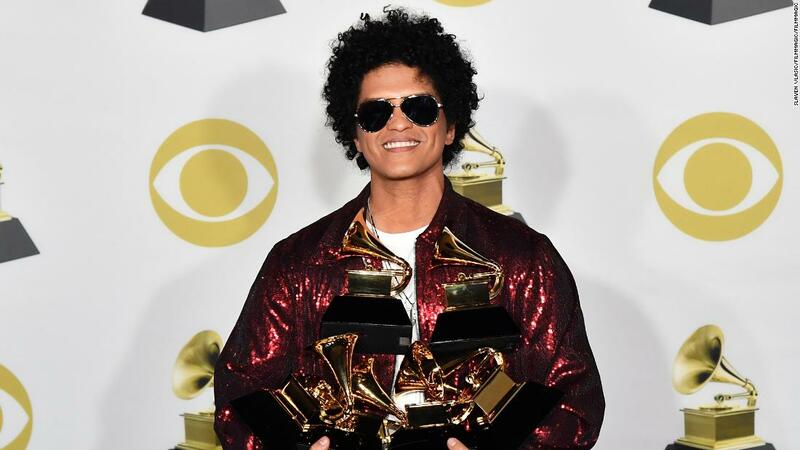 Bruno Mars may be a talented performer, but does he deserve sweeping the Grammys? What is Rock Music Again? With no rock/alternative songs or albums being nominated in the big three categories, only four sub-standard awards – Best Rock Performance, Best Rock Song, Best Rock Album, and Best Alternative Album are left as the main awards for rock groups to actually have a shot at winning. That may be fine in these changing musical times where pop, R&B and rap have clearly taken over as the most popular genres, but the Grammys/CBS chose to not televise any of these awards, which shows how much traction and influence the genre is having nowadays. Anyways, these rock categories have been typically more scattered and interesting in terms of the winners chosen in years past, but, given the choice, the Grammys still typically move towards the safest bets. Leonard Cohen getting the Grammy for Best Rock Performance is a classic case of voters giving the award to an older nominee who recently passed away (see: David Bowie last year in this same category). The Foo Fighters winning Best Rock Song in a flat out disrespectful group of nominees is, unfortunately, the right call, but “Run” is probably one of the worst songs that they’ve put out in their long career, so the question remains of whether it even deserved to be nominated. Dave Grohl and the Foo Fighters remain one of the only worthwhile bands left representing mainstream rock, but “Run” and its accompanying album, Concrete and Gold weren’t really deserving of much praise. Luckily, Rock Album and Alternative Album were much more diverse categories and the winners (The War on Drugs and The National, respectively) certainly at the very least deserved the acknowledgment over other nominees like Father John Misty complaining for 74 grueling minutes, Gorillaz being anything but the Gorillaz, and disappointing albums from Arcade Fire, Queens of the Stone Age, and LCD Soundsystem. It’s easy to see why these two artists won – chalk it up to Grammy voters for knowing halfway decent alternative when they hear it. Kesha had one of the best front to back album efforts of 2017 with her stunning comeback LP, Rainbow. After being suppressed by her label and her former producer and being involved with multiple lawsuits, Kesha’s return was a feel good story to begin with, but the fact that Rainbow was so empowering, diverse, and flat out interesting should have made her an easy candidate for at least one of the big three Grammys. Unfortunately, she got completely shut out of winning any awards after being nominated for only two in the depths of the general pop categories. For years, people have pointed to the Best New Artist category as the prime example of the Grammys being behind the times. By the time the Grammys recognize an artist as being the best “new” one, they’ve already been on the scene for years. Maroon 5, who won the award in 2005, released their debut album Songs About Jane three years prior in 2002, and the band Fun. debuted in 2009 but didn’t win it until 2013. Last year, Chance the Rapper (rightly) won, but he first started gaining notoriety in 2013. This year, Alessia Cara – most known for her shrieking empowerment anthem “Scars Till Your Beautiful,” – won, over a much more deserving SZA. If it takes four years to recognize an artist as being “new” and you’re still making the wrong choices, something’s wrong. I didn’t exactly know that this was an award specifically, but it’s probably become one of my new favorites that I’ll look out for in the future. Nominees this year included the Guardians of the Galaxy Vol. 2 Original Soundtrack, the OSTs for Baby Driver, Hidden Figures, La La Land, and Moana. At the end, it was the most traditional and safest of the bunch (La La Land) that ended up winning. While it wasn’t even close to being my favorite movie of the year, I would accept the argument that it added the most to the movie itself.